Fusarium species are found worldwide as plant pathogens and saprophytes (a fungus living on dead or decaying organic matter). Losses to plants are most commonly from a vascular wilt affecting various crops grown in greenhouses. 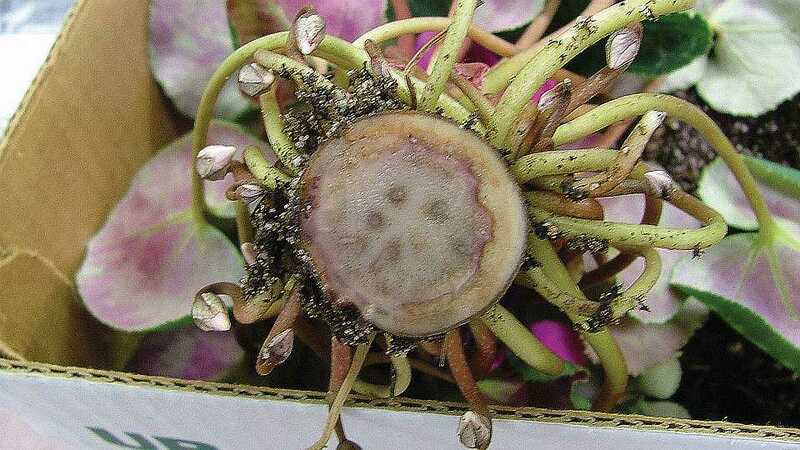 Here, we’ll focus specifically on Fusarium in cyclamen. As cyclamen is quite a long crop, it’s to the dismay of growers that symptoms often aren’t apparent until the plants begin to flower. Only a small percentage of plants show symptoms at transplant, roughly three months after germination. However, after 30 weeks, 34% to 71% of plants can be infected. When signs do become visible, the most common symptom in young cyclamen plants is bright-yellow leaf chlorosis beginning at the leaf base, often on one side of the plant. Leaves generally remain turgid. As symptoms progress, leaf flop occurs as stalks weaken, and older leaves turn brown. Young plants’ root systems may show vascular discoloration or turn dark brown to brownish black. Corms remain hard, but when cut horizontally, discoloration in the vascular bundles can be observed on one side, increasing in severity as the plant matures. If humidity and temperature levels are ideal, white to pinkish fruiting bodies may develop at the base of the tuber on the stems. Environmental stresses such as drought and extreme heat can hasten the development of Fusarium wilt in cyclamen. Fusarium enter and spread in the greenhouse through spores, which infect plants through roots via wounds or natural openings. Over two to 13 weeks, the fungus works its way up through the roots, into the vascular system of the tuber, and into the plant. Fusarium management should start with good sanitation practices at the beginning of production. Sources of inoculum over which growers have direct control include the use of infected soil, which allows the pathogen to harbor in weeds and compost piles, as well as reusing infected pots and trays. Fusarium can survive on various surfaces including wood, concrete, and polyethylene film. Strip-It followed by KleenGrow is very effective on all three surfaces. Other effective products include GreenShield II or SaniDate 5.0. Containers should provide good drainage, containing 15% to 30% perlite, such as Premier ProMix HP, LM-6, LM-16, or BK25, while avoiding heavy peat media. Trays should support pots, but create air space between the tray and the ground. Conditions become optimum for pathogen development in cyclamen at 82ºF. Temperatures above 86ºF increase severity due to excessive transpiration that occurs, while development slows at lower temperatures. Shade plants to keep the temperature under 73ºF. Avoid fertilizing with ammonical sources of nitrogen, and maintain a soil pH above 5.8. Once a plant is attacked, it will fail to become marketable and should be removed immediately. The practice of drenching remaining asymptomatic plants alone with fungicides has not proven 100% successful and can take a toll on the remaining plants, so this approach should be used as a last resort. Fungicides labeled for Fusarium include Banrot, Cleary’s 3336, Medallion/Emblem, Terraguard, and strobiluron-based fungicides such as Empress Intrinsic, Fame SC, Heritage, Mural, Orkestra Intrinsic, and Pageant Intrinsic drenches. Plant protection is often implemented with the addition of biofungicides to protect crops against Fusarium wilt. These include Actinovate, Companion, Obtego, RootShield, RootShield Plus, PreFence, and Pvent (preventive biofungicide drench). Research studies continue to enhance the benefits of pairing biological fungicides with registered fungicides to yield a significant reduction in Fusarium disease development. 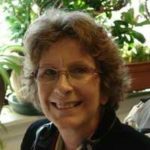 Joanne Lutz ([email protected]) is a GGSPro Technical Specialist for Griffin Greenhouse Supplies. See all author stories here.